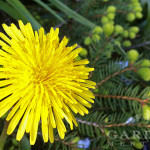 Learn what young weeds look like so you can pull them early & often! 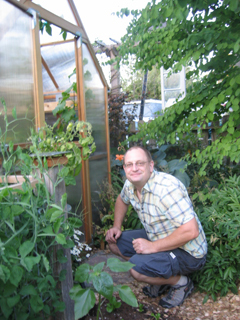 Many have written in recently to ask for more information about the small, residential greenhouse I added to my gardening world earlier this year. We purchased it back in February at the Northwest Flower & Garden Show, received the kit in mid-March, and had it assembled on St. Patty’s Day. Now, about four months later, I’m still in love with this little outdoor hot house. We’ll see how it fares later, in the winter, but for now, let me share what it is I adore about our little playhouse. 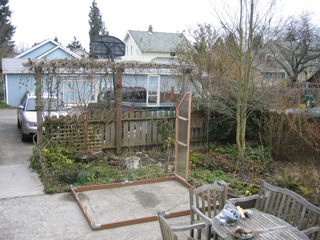 First, we decided to redesign our back garden spaces along with adding the greenhouse to our back patio area. My hope was to reclaim some of our ornamental spaces from “the dog zone” and transform them into mixed-use edibles and decorative plants — outside the dog zone. Part of this plan meant changing out our old fencing and putting in a new wire fence on which edibles might grow and through which we could see the reclaimed areas in the garden. The other part of the change involved adding a greenhouse with two doors. This would allow us to enter the greenhouse from the patio and exit it through the opposite end to enter the garden. So, we asked for a kit with two doors rather than one with a venting end. So far, it has worked beautifully. The next change involved adding our own customized shelving. The kit comes with one redwood slat shelf. It looked cute at the garden show, but from my experience working in greenhouses, I knew I’d want more shelves and that expanded metal fits my needs better than redwood. So, we sourced expanded metal sheets and Bob built four custom shelves. Again, another great, functional solution. And, finally, we added a couple of thermostats to monitor the heat/cold, and we’ve been adding wire for seasonal climbers like lilikoi, cucumber and watermelon. Fortunately for us, we already had a level concrete slab patio abutting garden beds on which to construct our greenhouse. We sunk the anchors into the beds, and despite some pretty nasty wind storms already, this puppy is staying put! The greenhouse comes with a self-venting roof, which is fantastic. When the greenhouse reaches a certain temperature (you can choose your venting temp through simple modifications of the wax cylinder), the roof opens a bit. It continues to open as it gets more and more hot inside the house. I do still open up the dutch doors on hot days — not just to vent and keep the airflow up to reduce disease but also to invite in pollinators. Getting pollinators to visit the greenhouse has been a bit of a challenge. Keeping pests like fungus gnats and leaf hoppers out has also been a challenge. When the poor bees come in to do their work, sometimes they end up going directly for the sticky traps set out for the pests. Like balancing heat to encourage growth without encouraging fungal problems, so too is balancing the insect world in the greenhouse difficult. However, I’ve been fortunate. I had one minor problem with leaf hoppers passing off a Hot Lips Sage outside the greenhouse onto a cucumber just inside the Dutch door. And, I found aphids on some stressed out cilantro. I pinched out the leaf hoppers (and moved the sage further from the greenhouse), and I simply removed the cilantro from the greenhouse without issue. Slugs do cruise the floor of the greenhouse, but I’ve worked to keep plants they don’t like in that area — peppers and tomatoes they happily leave alone. 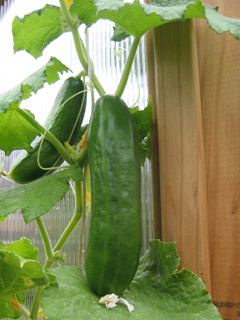 So far, we’ve harvested early tomatoes and cucumbers out of the greenhouse. Much earlier in the year we had lettuce galore coming out of the greenhouse before it was ready in the garden. It’s July, and I already have kale, cauliflower, cabbage and broccoli started in the greenhouse for winter. Too, we have a single watermelon forming and many passionfruit on the vine. Because everything is grown in relatively small pots in the greenhouse, we have found that the plants become a bit root-bound and require additional attention. For winter, we’re still considering our approach to maximizing our greenhouse yield. We may build some custom boxes for growing greens. This would ensure we use as much space as possible in the rectangular space; round pots just don’t work perfectly. We may or may not add heat and light. Likely, we’ll want a bit of it available once the deepest, coldest days of December and January hit. But we’ll see. Like the garden itself, the greenhouse will continue to evolve and change with our needs. For instance, we’re considering adding bee keeping nearby in hopes of attracting them into our greenhouse plants. So far, we’re very happy with our modified kit greenhouse. We had planned for Bob to build a greenhouse from scratch. It would have been quad-wall polycarbonate instead of the twin-wall we now have. It would have had finer joining. The wood would have been clear cedar instead of redwood. And, odds are, it still wouldn’t be finished given the number of projects Bob has on his plate. And, it would have cost more in the end than the kit. These all weighed in heavily on our choices in purchasing this greenhouse. It is a lovely addition to the garden. Friends’ kids adore it and treat it like a playhouse. And, the plants, well, they’re in heaven — warm, moist, and well lit. 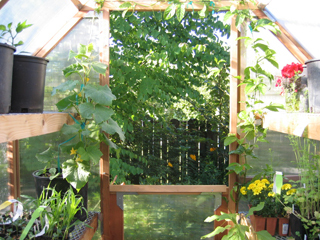 Like my friend Willi at Digginfood.com (link to dead site deleted in 2015), if you’ve now got greenhouse envy, consider putting one on your birthday wish list. Maybe you’ll get lucky. Mine was ready to start filling just around my birthday this year, so I can attest that this acquisition method can work! Another modification we did was add gate hinges to the doors instead of using the sliding bolt locks it came with. I also drilled holes and ran string to the latches from the inside so you can be in the greenhouse with both doors closed and still get out ;-). Thanks for sharing your ideas about remodeling garden. You have a great Greenhouse Back Door. Very interesting article. 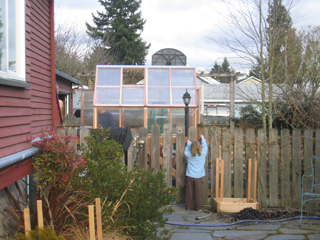 Question: Do greenhouses in shady place, my backyard work, in Seattle (Redmond) area? The space we have is on the eastern side of house. So there is some late morning and early afternoon sun. Mostly shade though. Before investing in the green house, I would like to get advice about growing with green house in shady area. Carlos, it’s really hard to say. 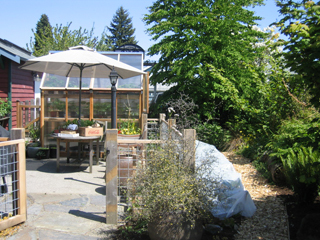 Ideally, your greenhouse is in a sunny spot. But, it can be more complex than that. For instance, is it always in deep shade? Maybe in the winter the trees around the spot actually lose their leaves, and it will get winter sun allowing you to use it more in winter. Some shade in summer can be a good thing. If a greenhouse gets too hot (even if it vents well) the plants can wilt and shut down. Many commercial greenhouses actually have systems to pull shade cloth over portions of the greenhouse to create shade (or filtered sunlight) at times. And, what do you want to grow? If you’re growing plants that do well in deep shade but need some protection from the elements &/or some heat, a greenhouse may work for you. Without seeing the site and understanding the goals, it’s hard to give just one answer. My own greenhouse gets a bit of first light sun in summer. It is shaded mid-day and then gets blasted with sunlight afternoon until sunset. So it works for sun loving crops, even if it does miss some of the morning and early afternoon sunlight. In winter, the trees and vines that block it from summer mid-day light are bare, so it gets whatever sunlight is available through the entire day from early leaf drop in autumn until early leaf break in spring (about Sept-late March).